IAST brings you the most advanced 3-yearfull time hospitality degree in collaboration with the 8th largest University of India Andhra University which is internationally reputed. 10 +2 certification from a recognized Board or University with English as one of the compulsory subjects in the curriculum is the minimum eligibility for joining this alluring world of hospitality and tourism. Accelerated Experiential Andragogy is designed to fine-tune the physical, mental, emotional and professional faculties of the students in order to empower them to work in sophisticated and high profile firms. It is a residential/non-residential program with strict schedules, activities, workshops and skill development programs to enhance the overall learning potential of the students. 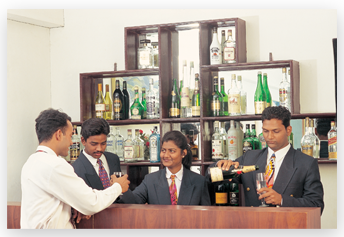 The mix of industry experienced faculty, course design and curriculum makes it one of the elitist hospitality programmes in India. On completing the program student earns Bachelor’s degree from Andhra University.